As digital business is emerging, it’s disrupting business. What does that mean? It means that how you do business must change. And it’s not just adding a Twitter feed or creating a Facebook page. It’s much more than that. It really means that you have to look at how you are doing business – your processes, your policies, your departments, your people, your technology and make major changes. I can remember when organization change management first became a discipline. 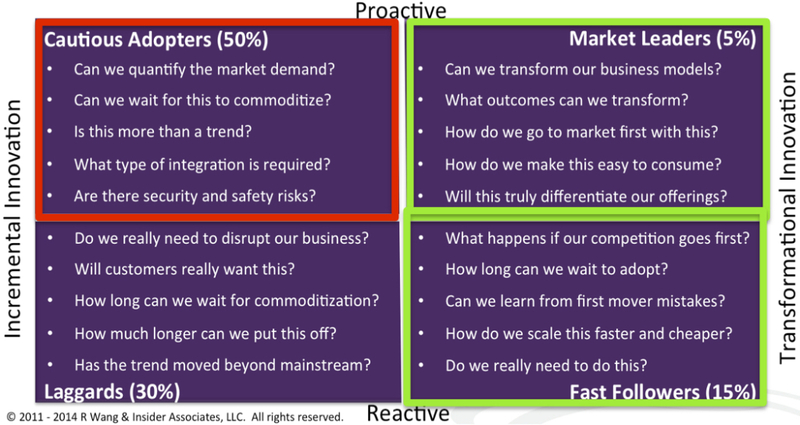 But back then there were so many that pushed it aside, crossed it off their to do list and basically thought it was “Kumbaya” and the “soft stuff you can’t measure.” Which quadrant is your business in? You need to understand culture, community, and credibility. This means that you need to start with Customer Engagement Optimization. How do you make sure you understand your prospects and customers? Where does listening play a role? Do you have a process to listen to what your employees as well as what your customers think about the company, its products and services? If not, start here. You need to understand how channels, content, and cadence of the content on the channels work with each other. So once we understand the people centric values, how do we engage? What are effective models to connect? Organizations need to transform the way that they interact with their customers – online and offline. What’s the best way to start doing this? Do you just jump into the online conversations? Is it even the right channel? What content makes sense? How often do you reach out? Are your customers and prospects responding? Once you have some sense about what customers are talking about – to each other, to your company, to your competitors, how do you deliver an end-to-end actionable intelligence where the workforce is optimized to respond or hear about the issues or kudos? What should be measured? How do you focus in on the right metrics that matter? What this means is that there is the need to change your business model. What business are you really in? Are you selling printers or customer experiences? The shift to digital business changes not only business models but also how companies engage with their customers. And you have to know what business you are in to do this. If you want to know more about digital business disruption, join Ray Wang and myself on a webinar, May 26th at 11 AM PST. MY POV: Most business are not prepared for what it takes to make the shift to a digital business. Where do you think you stand with respect to your business’s readiness for change? 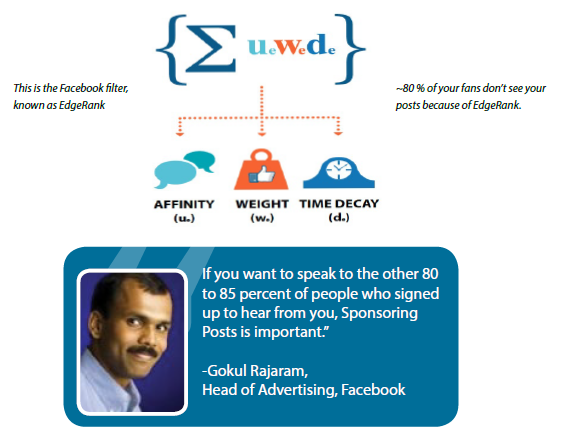 Why did Facebook develop EdgeRank? Are you one of those brands spending hundreds of thousands or millions of dollars on creating content for social media interactions? Facebook themselves admits the average brand page only reaches 16-17% of its fans. Data from PageLever shows that for brands with millions of fans, even less of their fans see the content. They estimate the content only reaches ~3% of their fans. Why is this so? It’s because of an algorithm, EdgeRank, that calculates what posts to filter out. When Facebook allowed brands to have pages, brands began posting a lot of content. Facebook users felt there was too much content coming at them, almost so much that it felt like spam. As a result, Facebook created a filter that determines who sees particular posts. There are three parts to the filter. The first part of the equation, affinity, takes into consideration how much time you spend interacting with certain friends, groups and pages. If you are spending a lot of time interacting with them, then your affinity will be stronger. The next piece of the puzzle is about weight. Weight is essentially the level of interaction a piece of content gets. For example how many likes and comments. And the last piece to the puzzle is time. Over time, a post’s relevance decays making it less important, pushing it down the feed. What are the three big problems around content and engagement? The truth is most brands don’t have the budget to create enough great content to be effective at engaging their customers. What makes matters worse, in addition to a content creation budget, you also need a promotion budget. And the cost to promote content can become prohibitive. How much does it cost a brand to send a Sponsored Posts or Stories? • $134,400/ yr just to get your content seen! How Do I get EdgeRank to work in my favor and rise above my competitors in the cosmetic industry? What makes a better post in the cosmetic industry? Content Management is a new buzz word. I think most brands didn’t realize that when they went down the path of social media, that they would end up becoming content creators and publishers. The fact is that there are 3.5B pieces of content shared per week. That’s essentially what is causing the big data explosion. People are sharing everything – posts, status updates, links, pictures, videos, etc… And with all that content, it makes it very difficult for a brand to stand out… In fact, with Facebook’s EdgeRank algorithm, nearly 80% of a brand’s content is not seen on a fan’s newsfeed. What that means is that brands are spending a lot of money on content that’s not seen and that means lower engagement. Why is engagement so important? In the old marketing funnel, it was very clear. Drive awareness to get as many people as possible into the marketing funnel. Brands spent / spend millions of dollars on getting the attention of millions of people with the idea that the more people at the top of the funnel could translate into more sales. The marketing funnel steps were: awareness, interest, consideration and purchase. Most Marketers didn’t take into consideration the idea that customer service should actually be part of the marketing funnel. Why? Customer Service is where customers reach back to the company after they have been interacting with a company’s products or services. And with customers being able to talk to each other online, those customer to customer conversations are driving referrals and advocacy, which directly influence sales — far more that the top of the funnel stages. To get more referrals and advocacy, of course you need to have good products and services. If you don’t, complaints about that will surface in social media channels. Assuming that your products and services are up to meeting the brand’s promise about what a customer can expect, then the next step in referrals and advocacy are good word of mouth – online and offline. People trust people like themselves – even if they don’t know them personally more than a brand’s advertising. 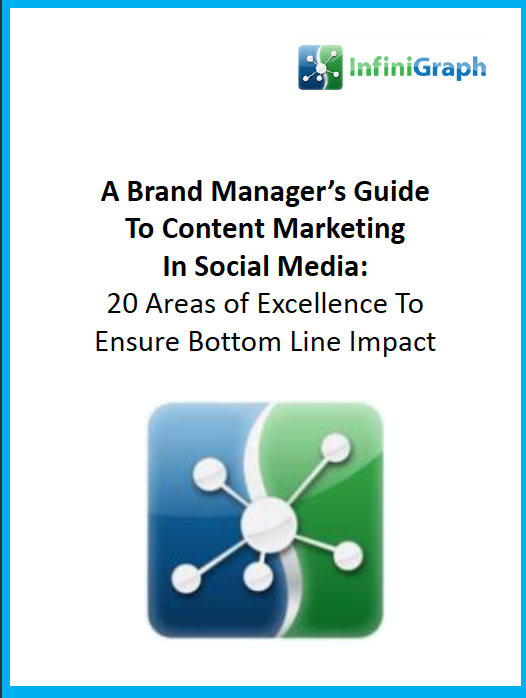 So this report helps brand managers understand how to decide what content is important to drive engagement. Continuing The Social Network Show series, this week I interview Bill Belew, Professional Blogger and Educator, and we sit down to discuss Google and Search Engine Optimization. Bill Belew is a professional blogger whose primary source of income is from his network of blogs. Bill sells advertising. He also gets many requests to speak and consult with clients on inbound and content marketing. Bill has now attracted 105, 120,000,000 (120 million) page views across his set of blogs. That is not a typo. In addition to being an expert blogger, Bill is a professional educator (university professor for the past 30 years) who loves to teach.